Modern Americana or driving an old truck down a dirt road. 15. Where Have All the Good Times Gone? 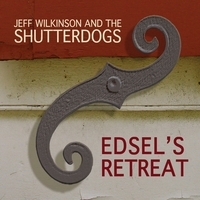 Singer-songwriter Jeff Wilkinson has been playing music professionally since the 1980’s. His first album “Pitchin’ Pennies” was released in 1984 and received high praises both at home and abroad. Jeff began touring the Midwest and Northeast as a solo act eventually winding up in New York City where he became involved with the Greenwich Village Fast Folk Music scene. He performed at the now legendary Folk City and at the SpeakEasy. A brief tour in England and Europe in 1987 led to his meeting the owner of Brambus Records. Since that time he has released four CD’s on the Brambus label as well as two releases on the Vermont based Gadfly Records. He has made numerous tours throughout the U.S. and Europe and has shared the stage with many of folk music’s best-known names including Jesse Winchester, Pete Seeger, Bill Morrissey, NRBQ, Peter Case, Gillian Welch and Robert Earl Keene. He has played in such noted rooms as Nashville’s Bluebird Café and New York’s Bottom Line and has co-written songs with such notables as Fred Koller and Leroy Preston. A multi-instrumentalist, Wilkinson often accompanies himself on guitar, mandolin and harmonica. "Edsel's Retreat" features long-standing band members Sara Milonovich on fiddle, mandolin and vocals, multi-instrumentalist and producer Greg Anderson on guitars and bass and Dan Fisherman on drums and percussion. The CD also features guest artists Jeremy Baum (Shemekia Copeland) on Hammond B3 organ, Andy Goessling (Railroad Earth) on dobro and Banjo-Matic and Buddy Conoly (Eileen Ivers and Immigrant Soul) on accordion and pennywhistle. The album was recorded in Wilkinson's former horse stable in Newburgh, NY and was mixed and mastered by Mark Dann in Woodstock, NY.